Green sand molding is the most common foundry method for producing small to medium castings. In 2013, over 50 percent of green sand castings produced in Europe were used in road vehicle production for applications such as brake discs, engine blocks, drive shafts, pivot bearings and suspension components. However, increasing environmental regulation and general health/environmental awareness are putting pressure on foundries to improve the ecological footprint of green sand molding. The introduction of a unique low emission additive technology by Clariant, a world leader in specialty chemicals, is enabling foundries to reduce BTEX emissions from green sand systems by up to 80% and produce highest quality castings with improved surface quality at optimum productivity. To assess the potential of this technology to contribute to the sustainability improvements wanted by foundries and related industries, this article examines the current primary techniques for emission reduction from bentonite-based green sand. It outlines the principles of the new technology and explains the innovative testing method developed by the company to measure and compare emissions of aromatics from lustrous carbon formers under realistic foundry process conditions. Finally, it shows results achieved in practice in a European foundry using the new low emission additive technology. Reduction of foundry emissions has become a predominant issue for the industry. In line with the general rise in awareness of health issues and the environment, foundries are looking for feasible solutions to increasing highly-demanding environmental regulations and standards including the 2020 Gothenburg Protocol on emissions. For many foundries, bentonite-based green sand molding remains the most common method for producing small to medium iron and steel castings for a wide range of industry segments. The production demand for casted parts is rising. The fact that liquid iron with temperatures of up to 1500 °C hits the coal in the green molding sand makes the creation of volatile organic components and also dangerous BTEX (benzene, toluene, ethyl benzene, xylene) emissions inevitable. 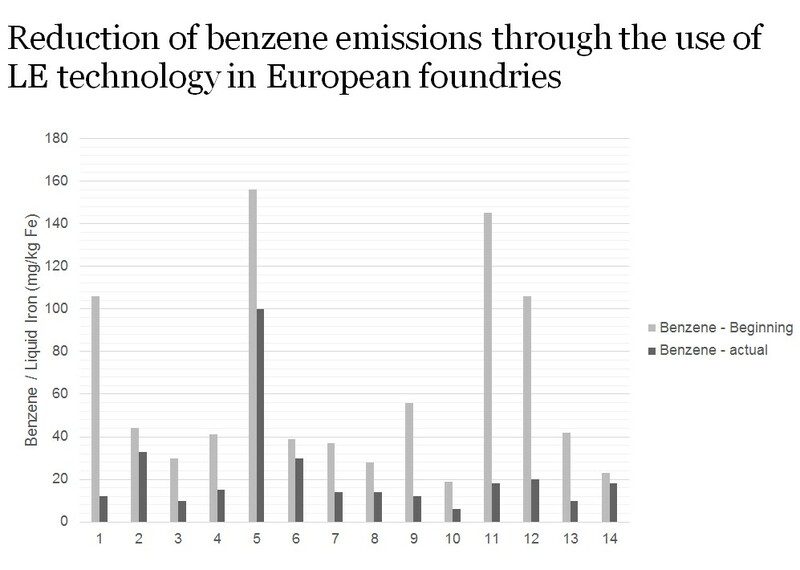 Accordingly the legal limit for benzene emissions, for example, is four times higher for foundries than for other industries. The ongoing important role of green sand molding means foundries face the critical challenge of improving the ecological footprint of the system and reducing BTEX emissions. At the same time, within operations there is strong emphasis on achieving a potential increase in productivity while maintaining quality. Consequently there is demand from the foundries and related industries for support in realizing a practical balance of factors. To help foundries to address this combination of priorities, Clariant as a worldwide supplier of green sand additives, undertook proactive research into the sources of emissions within green sand systems with the aim of creating better understanding of the individual contributions. This information served as a basis for identifying potentially viable alternative solutions to support the industry. First steps were to analyze emission sources. Clariant’s initial in-depth laboratory analysis showed that both the organic binders in the cores, as well as the traditional carbon-based lustrous carbon formers (LCFs) in the bentonite-based green sand system contribute to BTEX emissions. Coal has the lowest emission level compared to the other types of lustrous carbon formers like resins. The results are presented in Table 1. Within a bentonite-based green sand system, LCFs are important for maintaining mold quality. Classic LCFs function by reacting with oxygen to form a reductive atmosphere within the mold. This produces a thin layer of lustrous carbon on the surface of silica grains which prevents penetration of the liquid iron with the green sand and creates a smooth surface (Illustration 2). A green sand cast without LCFs is penetrated by the iron, meaning a rough casting surface is created as shown in Illustration 1. There are three possible concepts to reduce emission in a bentonite-based green sand molding system: reduction, adsorption of emissions, and substitution of the classical lustrous carbon formers. 2. Adsorption: adsorption of aromatics only shifts the emission from green sand to waste disposal. It needs high investment since only the separation of adsorber material and green sand is a logical approach. 3. Substitution: emission-free additives for reduction of the LCF content. The most cost effective way is to substitute the lustrous carbon formers with inorganic carbon which does not form any organic volatiles. Graphite is the natural source of inorganic carbon offering similar properties to a lustrous carbon former when combined with special dispersing agents. As Clariant is an established provider of green sand additives, the focus was placed on exploring option three to determine an alternative effective solution for foundries. A systematic screening of natural carbon materials with a low profile on volatiles’ creation under casting conditions that can substitute the traditional materials was carried out. Over the course of a long development process it was possible to identify a special grade of graphite fulfilling all requirements. This graphite became the source of Clariant’s Low Emission (LE Technology), the specific details of which are outlined in the following paragraphs. The graphite is only one part of the technology. In contrast to bentonite, graphite cannot be dispersed very easily in a green sand system, therefore to ensure success it was found that a combination of special graphite and dispersion agents is very important for the application of graphite in a green sand system. The dispersing agents guarantee a homogenous coating of the silica sand particles with graphite plates during the green sand processing (as shown in Illustration 3). The LE Technology is available as two unique products marketed under the names of GEKO® LE and ECOSIL® LE (patent filed at the European Patent Office). GEKO® LE consists of an optimum blend of high-quality bentonites, selected graphite grades and suitable dispersants. It minimizes BTEX emissions from the green sand system because it does not contain any volatiles and organic compounds. ECOSIL® LE combines the properties of GEKO® LE and high-quality coal in a premix form and features carefully selected types of bentonites, coal, graphite and dispersant grades. Both products have high actives concentration. In a green sand system, the homogenous coating achieved with Clariant’s innovative graphite-based technology ensures no metal penetration and the creation of a smooth mold surface. Furthermore, the graphite fulfils the role of lubricant and improves the mechanical properties of the green sand mold. These characteristics lead to multiple quality- and productivity-related advantages for foundries as smooth surfaces and low sand adhesion create high-precision and perfectly formed castings with high throughput and low defect and scrap rates. The high concentration of actives and lower BTEX concentration in the sand system yield higher sand recycling rates and reduce waste sand. The products are also fast mixing which adds to the other productivity advantages. For ECOSIL® LE it should be noted that since lustrous carbon generation is no longer a main requirement of the coal part of the premix, BTEX emissions can be drastically reduced while maintaining high throughput and low scrap rates. To obtain an accurate overview of emission profiles, Clariant developed a unique method for measuring and comparing emissions from green sand systems under realistic foundry process conditions. The creation of an application laboratory test rig was necessary to analyze the emission data of a green sand system based on Clariant’s new technology and to provide support for customers in creating an acccurate profile of the BTEX emissions of an existing system. Within the test rig, liquid iron is poured in a standard green sand mold and all the gases are collected in a specially designed absorber trap. The gases are then desorbed from the absorber and analyzed both qualitatively and quantitatively with state-of-the-art GC-MS techniques. To prove the efficiency of the LE system to customers and authorities, customers send Clariant a green sand sample from their established process using traditional additives prior to introduction of the LE Technology. 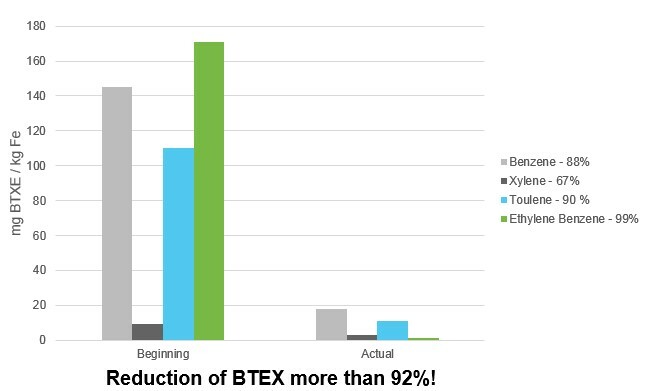 Clariant measures the current BTEX emissions and uses the results as a baseline later. After introduction of the LE Technology, the foundry sends a second green sand sample, which is also analyzed in the application lab with regard to BTEX emissions. 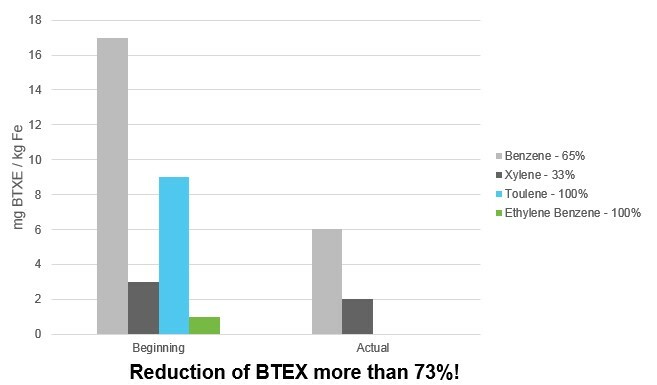 The direct comparison of both samples proves the reduction of BTEX emissions from the green sand system to the customer. Customers who also need to reduce their emissions from cores can substitute organic with inorganic binder systems. After the R&D studies, Clariant showed significant success in applying the Low Emission Technology at important European foundries. The comparison of the benzene emission of foundries processing LE Technology shows very clearly that in most of the cases a reduction of the benzene emission by 50 % or even more can be realized. If a foundry is starting with a very high level of emission, a reduction of up to 80 % is possible. We can look closely at examples from two foundries. Our first example is a foundry producing brake equipment on vertical flaskless molding lines. There were official requests from environmental authorities to reduce BTEX emissions into the atmosphere. Our target was to reduce BTEX emissions by using Clariant LE Technology while maintaining the same green sand properties (with efficient shake-out) and same good casting quality level at lower production costs. Our second example is a foundry producing brake equipment for trucks on horizontal molding lines. This customer was using a liquid lustrous carbon generator and our pure clay GEKO®. Since there was strong pressure from environmental authorities to reduce pollutant components in the molding sand, we aimed to replace the Liquid Lustrous Carbon Generator with Clariant LE Technology, with the view of reducing pollutant in the molding sand while maintaining the same casting surface and efficient shake-out at lower production costs. To transfer from a standard system to a low emission system, it is important to consider several steps before, during and after conversion. Based on two years’ R&D research combined with the last three years of industrial experience, each foundry needs an individual exchange plan trial. This exchange process is supported by the measurement of emissions on a pilot plant scale. Firstly, the forming and green sand process is inspected. Clariant will provide detailed characterization of the emission of the green sand system using the foundry test rig. An exchange concept for LE Technology is defined with the support of Clariant foundry experts. Next, the introduction of LE Technology to the green sand system should be done step-wise with parallel characterization of the green sand system by the Clariant foundry service laboratory. It is necessary to ensure regular discussion of results before defining the next exchange step. The first step is the most important in the process due to the introduction of graphite and, correspondingly, the reduction of coal dust in the system. When the foundry decides to switch to further steps, the exchange process continues by decreasing the coal dust content by 10 to 20%. The last specific step occurs when small anomalies appear in the molding workshop. Laboratory studies show that classical lustrous carbon formers like coal dust and resins are responsible for the formation of BTEX aromatics in a green sand system. The emission of aromatics can be reduced by substituting classical lustrous carbon formers with graphite which should be combined with a dispersion agent. Industry experience of Clariant LE Technology shows that it is possible to reduce BTEX emissions from green sand by up to 80%. This decrease in emissions is supported by an obvious decrease of foundry additives consumption, an improvement in casting surface, and a boost to foundry throughput and productivity.